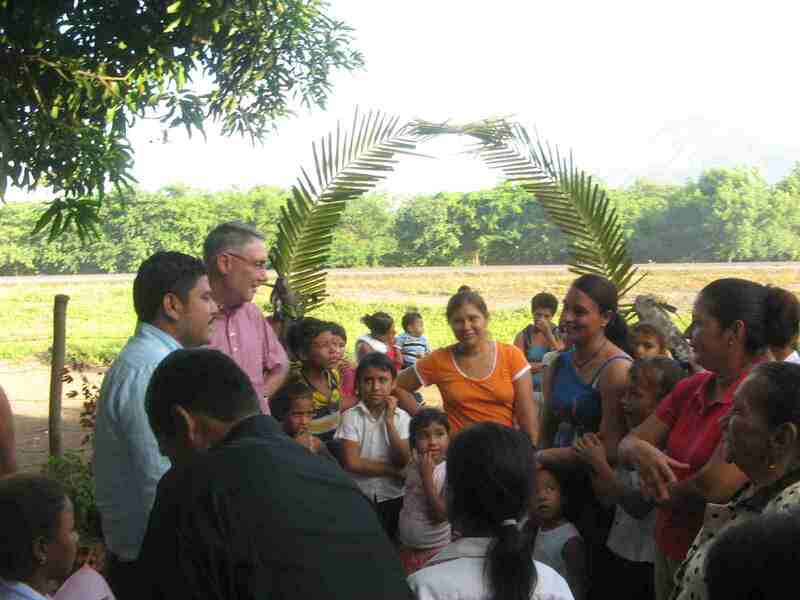 Robert Granke, the executive director of CLWR, arrived in Nicaragua on Tuesday, November 24th to begin a 5 day visit to our LCC Mission and the congregations, pastors and deaconesses of Iglesia Luterana Sinodo de Nicaragua. In extending the invitation to this Social Ministry partner of our Synod, our desire was to provide an on-sight view of the social ministry projects carried out through our mission centering especially on the Christian Children’s Education Program which CLWR has been supporting. The program, conducted in all 23 congregations of ILSN, provides an average of 25 scholarships in each community to the neediest children. The scholarship includes the required school uniform, shoes, backpack and school supplies. Each child is also enrolled in the tutoring and Christian Education class held five days a week during that period of time when the children are not in school (Children attend school either during the morning or afternoon hours.) 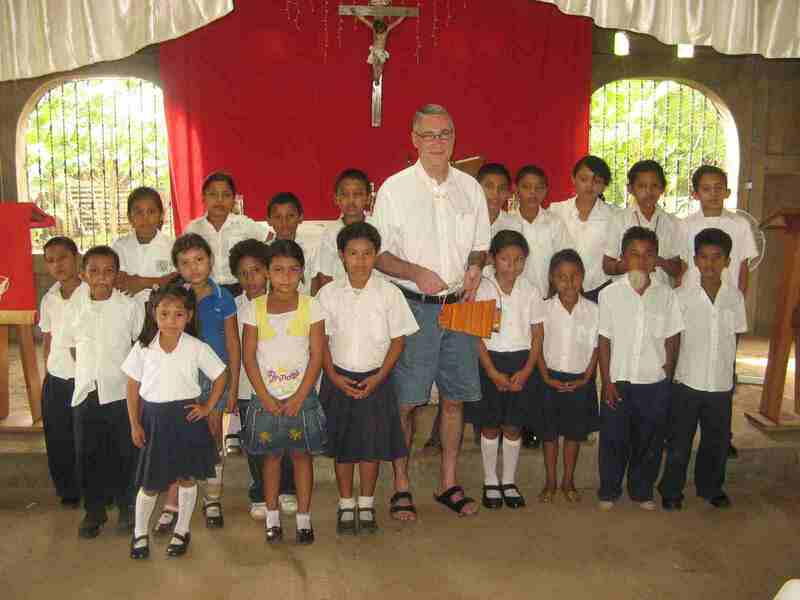 These classes held in the churches and led by teachers and deaconesses provide tutoring and homework support for the children in Math, Spanish and other subjects; A portion of the time is also set aside for Christian Education and cultural activities. There are over 750 children enrolled in the program. CLWR has provided support for about 250 children. 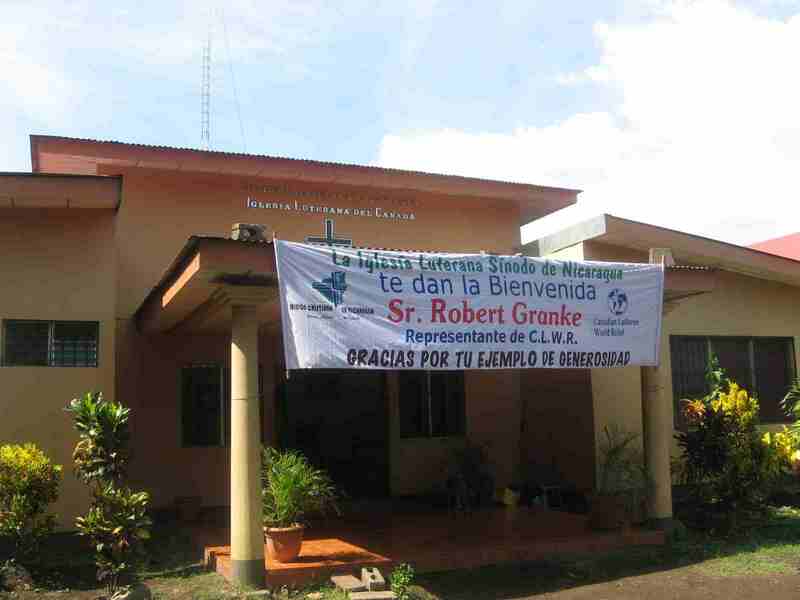 Robert Granke’s tour included visits to the communities of El Piloto and Racheria on Tuesday; to Las Marias, Marionelle and Chichigulpa on Wednesday. Thursday’s visits included El Bonete, Israel, Camilo Ortega and Santa Patricia. In each of the communities, Mr. Granke expressed delight in being able to see firsthand how the program has met with success creating in the communities an appreciation for education and in each child, a desire to learn and to do well in school. In addition to seeing first hand the Christian Education Program, Robert Granke was able to visit our Medical/Dental Clinic, our Sewing School, the Rancheria Food Program and hear an overview of our “Micro Loan” Program and our soon to begin “eyeglass lab”. Continuing discussions during the week explored other opportunities for LCC, ILSN and CLWR to collaborate on social projects in the region. Sunday (November 15) was a special day of celebration for the members of San Pablo in La Cartonera. They had been asked by Missionary Maximo Urroz, their former missionary and pastor, if they would host in their worship service the confirmation of the first four converts in the Synod’s new outreach ministry in Leon. Both Pastor Henry Chong, the present pastor and the congregation were pleased to oblige and we were excited in being invited to join in the celebration. While all baptisms and confirmations are joyous occasions in the church, this particular Sunday’s celebration was unique in the history of this young church. All three confirmands were men. A fourth man, Jairo Soto, was called in to work at the last minute and not able to attend. (His confirmation will take place in a later service) Of the three, Jose Martinez was the youngest in his middle twenties. The oldest was retired school teacher and poet, Fernando Nuñes in his early eighties. Silvio Fransico Sequia, a civil engineer, was somewhere between the two. The service was led by Pastor Henry Chong; Missionary Maximo shared the Word of God in the sermon and together the pastors carried out the rite of confirmation. As in our confirmations, each confirmand confessed their faith using the words of the Apostles Creed, and in pledging their faithfulness to Christ and to His Word, they received their blessing. 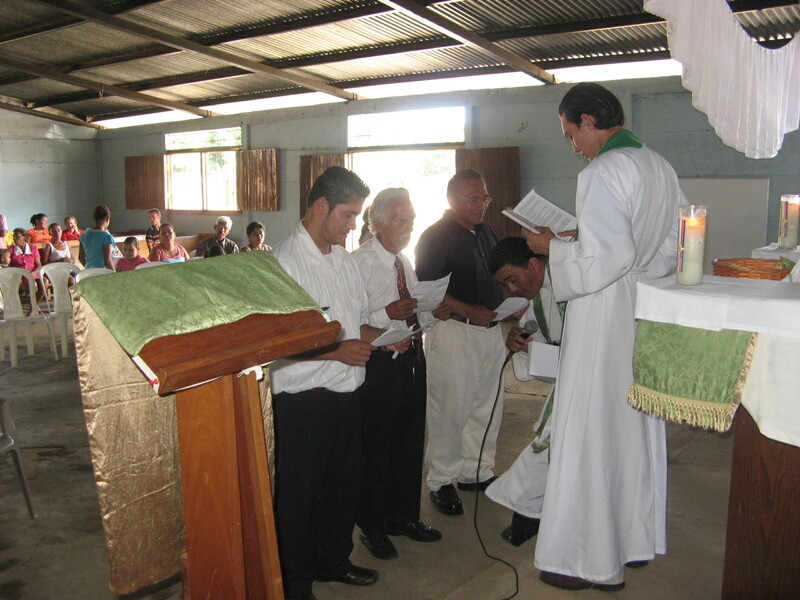 Following the blessing, each confirmand was given the privilege of addressing the congregation. Each spoke from the heart as they shared their faith in Christ and their thankfulness to God. My attempt to attach to this column a short video of Fernando Nunos address was not successful. Here is a rough translation of his message. “I give thanks to God for sending Dr. Martin Luther to show the truth and for all saints who through the years have shared this truth in the World. I give thanks to the Father, the Son and the Holy Spirit for the spiritual gifts given to me and for permitting me to become part of His church. I thank Him for this day when I am confirmed into this Christian faith through these Christian Pastors. And so God’s work of saving continues as our missionaries reach out with the Gospel. This past Sunday, All Saints Day, we were privileged to join with members and friends of Iglesia de Dios en Jesucristo in the community of La Joya as they gave praise to God for their blessings and dedicated their newly completed church. The following is a little of the history of this community and church. The community itself is a rather new. It developed shortly after the Hurricane Mitch disaster when residents formerly living near the base of Volcano Casita (which also erupted at that time) were uprooted and settled in the area. Efforts to reach these transplanted people with both physical and spiritual care was carried out by Deaconess Mayra Elena Lara and other members from the neighbouring church, itself newly formed, in the community of Rancheria. God blessed their labour and soon a small community of believers began to gather for worship and study, first under the trees, then in a “Ranchero” built with the support of a team traveling with Orphan Grain train. 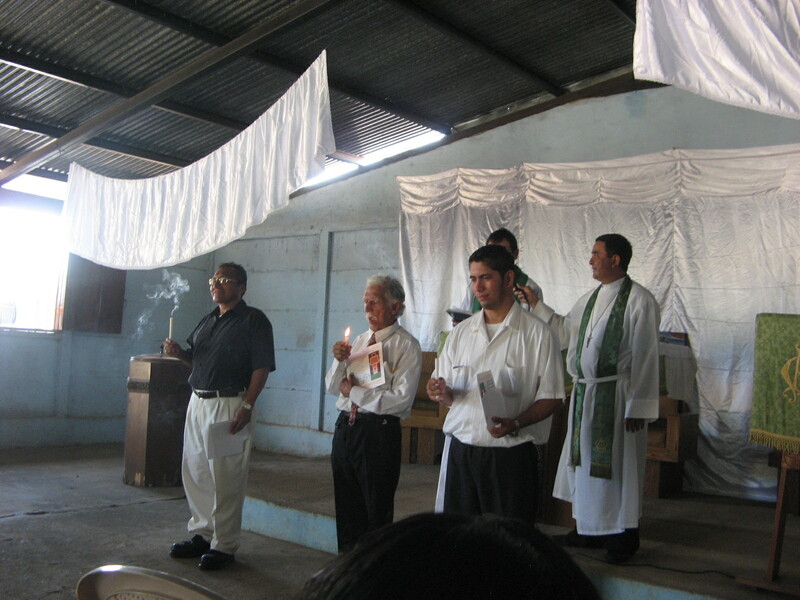 The “Ranchero” served well as a centre for worship and for the newly started Christian Children’s Education Program carried out by the church in the community. It was approximately 3 years ago that a team made up of members and friends from Mt. Calvary Lutheran, Red Deer and St. Paul Lutheran, Chilliwack, British Columbia began construction of a more permanent facility made of cinder block. This past May another team from St. Paul Lutheran returned to complete the structure adding windows, doors, a septic system and bathroom. The congregation hopes to have electricity and water before the end of the year. Pastor Marvin Donaire led the service of dedication assisted by Pastor Junior Martinez, Pastor Angel Salazar and Missionary Maximo Urroz. Pastor Junior shared God’s Word in the sermon. Basing his sermon on I Peter 2:5, he reminded us of the “church” which Christ Himself is building. This church is not made with cinder block, but with “living stones” which He Himself has brought into being by grace alone, through faith in the life, death and resurrection of Jesus Christ. Made “living stones” he told us, we are now privileged to “proclaim the excellencies of Him who called us out of darkness into His marvellous light.” Special guests from the neighbouring congregation in El Pilote (also served by Pastor Marvin) walked four kilometers so that they could join in the celebration. Iglesia de Dios en Jesucristo carries out an active outreach program in their community under the direction of Pastor Marvin and Deaconess Mayra. A highlight of that ministry continues to be their Children’s Christian Education Program. It is no wonder therefore that almost one half of those worshipping this morning were children. You are currently browsing the LCC On the Road blog archives for November, 2009.